Check out today’s Washington Post editorial, Extinct Sense. Here’s one paragraph: "H. Dale Hall, director of the Fish and Wildlife Service, recounted a battle he had with Ms. MacDonald over the Southwest willow flycatcher (photo), an endangered bird. Biologists in the field concluded that the bird's nesting range, which determines how much land the government should protect as habitat for the species, was 2.1 miles. Mr. Hall claims that Ms. MacDonald insisted on lowering that to 1.8 miles so that the nesting range would not extend into California, where her husband maintained a family ranch." Unlike the purged prosecutor stories that started with the firing of the U.S. attorneys in December, 2006, this story about the intentional disregard by certain Department of Interior political appointees of their duty to protect endangered species has been around for several years. I hope this story gets as much attention as the wrongfully fired prosecutors has. The good news is that we are beginning to hear about this not-so-fresh scandal from the mainstream media. On March 28, the Los Angeles Times reported, Endangered Species Act changes in the works. A draft, leaked Tuesday at Salon.com, included changes in the Act which would reduce protection for wildlife habitat and transfer some authority over vulnerable species to states. Talking Points Memo picked up on the Washington Post story and ran it as its "Must Read" story. You may recall that TPM is being given credit for digging into what happened with the fired U.S. prosecutors, forcing the mainstream media to finally pay attention to what was really going on in the Department of Justice. I have a friend, Bill Radtkey, (photo) who worked for the Bureau of Land Management, an agency within the Interior Department (as is the Fish and Wildlife Service) for 33 years. He started working with endangered species in 1968. In 1972, he was responsible for the endangered species program for all the BLM-managed land in California, which is a lot of land. 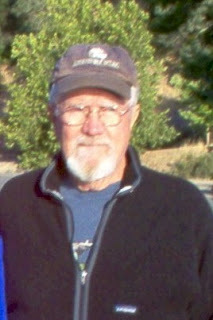 In 1980, Bill, and, incidentally, Mr. Reagan, moved to Washington D.C., where Bill managed the nationwide endangered species program for the BLM, which oversees one-eighth of all land in the U.S.
Now retired and living in Ukiah, California, I asked Bill what he thought about the stories that are now coming out about the lack of regard for endangered species by the very agencies charged with protecting them. He’s concerned about the proposed changes in the Endangered Species Act that would require individual agencies to do their own policing and oversight, with increased responsibility for state governments. Bill spent years working on putting together a team and collecting data for protecting the spotted owl. The official report disappeared; Bill had a copy in his computer. He said, "Few scientists want to work in an environment were scientific evidence has no bearing on decisions. The really good biologists who are the document authors tend to find jobs somewhere else." Bill described BiologicalDiversity.org as one of his main allies in the past, and sent me to a link to its October, 2006 press release, Bush Administration Political Appointee Reverses Endangered Species Protections for Wildlife. And yes, the “political appointee” is Julie A. MacDonald. If you don’t check any other links in this post, go to this one and read the whole thing. I’ve signed up for its newsletters. 2000-2008(? ): Was I a good American? Was I a good human being? The first question is asked by Rebecca Solnit, author of Hope in the Dark - Untold Histories, Wild Possibilities in a Guardian (United Kingdom) article published March 14, 2007, Was I a good American in the time of George Bush? Both Rebecca and Tod are asking us to do SOMETHING. If we don’t, will we have consented, through inaction, to “the crimes of this White House” against humanity as well as countless animals* and plants? I put a ? after 2008 because we have a tool to remove Bush and Cheney from office: impeachment. 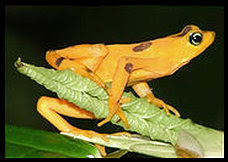 *Photo of a harlequin frog; 67% of this species has disappeared. The Iran-Iraq maritime boundary - What is Tony Blair relying on? The warmongering related to the March 23rd Iranian capture of 15 British sailors and marines is rapidly escalating. The British military personnel were seized in the 125-mile-long channel, known as the Shatt in Iraq and the Arvandrud in Iran. The mainstream media consistently states that the British sailors were in Iraqi waters. Whoa! According to former British ambassador to Uzbekistan, Craig Murray, in his March 28 post, Fake Maritime Boundaries, “The British Government has published a map showing the coordinates of the incident, well within an Iran/Iraq maritime border. The mainstream media and even the blogosphere have bought this hook, line and sinker. A) The Iran/Iraq maritime boundary shown on the British government map does not exist. It has been drawn up by the British Government. Only Iraq and Iran can agree their bilateral boundary…. This published boundary is a fake with no legal force. “ABOARD THE USS JOHN C. STENNIS [in the Persian Gulf] — American warplanes screamed off two aircraft carriers Tuesday as the U.S. Navy staged its largest show of force in the Persian Gulf since the 2003 invasion of Iraq, launching a mammoth exercise meant as a message to the Iranians. I have the same queasy feeling I had during the run-up to the attack on Iraq. Please take some time to read Betrayed in the March 26, 2007 New Yorker by George Packer. It’s subtitled “The Iraqis who trusted America the most.” The title of the article and the photo of an interpreter wearing a mask to conceal his identity pretty much say it all. Yet this long article, full of details of the lives of several translators, is well worth reading. 2. The press consistently reports that Iran is at fault. In February, it was the ''explosively formed penetrator,'' announced by the New York Times as the Deadliest Bomb in Iraq Is Made By Iran, U.S. Says, since discredited. 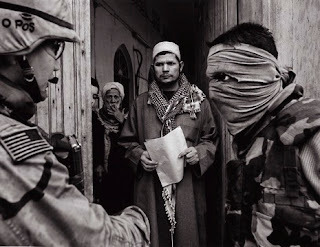 'The Iraqi military commander of the country's territorial waters cast doubt on claims the Britons were in Iraqi waters. We were informed by Iraqi fishermen after they had returned from sea that there were British gunboats in an area that is out of Iraqi control,' Brig. Gen. Hakim Jassim told AP Television News in the southern city of Basra. ‘We don't know why they were there...."
3. The fear engendered by the “Global War on Terror.” The March 25, Washington Post op-ed by Zbigniew Brzezinski, national security advisor to President Carter, Terrorized by War on Terror, wrote “To justify the 'war on terror,' the administration has lately crafted a false historical narrative that could even become a self-fulfilling prophecy. By claiming that its war is similar to earlier U.S. struggles against Nazism and then Stalinism (while ignoring the fact that both Nazi Germany and Soviet Russia were first-rate military powers, a status al-Qaeda neither has nor can achieve), the administration could be preparing the case for war with Iran. Such war would then plunge America into a protracted conflict spanning Iraq, Iran, Afghanistan and perhaps also Pakistan." This week, the former No. 2 official in the Interior Department, Steven Griles, has admitted to lying. He is the 10th person -- and the second high-level Bush administration official to face criminal charges in the continuing Justice Department investigation into Abramoff's lobbying activities. I’ve kept my eye on Griles for years; he’s anathema to environmentalists. While in Interior Department, he continued to have ties to energy and mining companies that were once his lobbying clients, the same companies he was charged with overseeing. There’s a good description of why Griles is facing incarceration in the March 24 Washington Post, Ex-Official At Interior Hid His Ties to Abramoff. 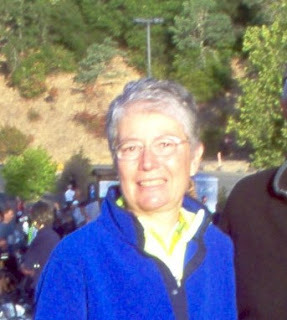 However, I offer you an exclusive story about Steven Griles from someone who worked for him, my friend, Janie Sheppard (photo), an attorney who now lives in Ukiah, California. 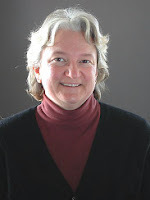 Janie, a retired career federal employee, first met Steve Griles in 1976 during the Carter Administration when she was sent by a task force in charge of implementing the brand new Surface Mining Control and Reclamation Act (SMCRA) to talk to a committee of the Virginia legislature. At the time, Griles was an assistant to the Governor of Virginia. The Governor's supporters did not want to see SMCRA, which regulates the environmental effects of coal mining, enacted. Griles assured Janie that it would be a friendly session--just some questions about how SMCRA would work. Janie said the session was extremely hostile. At the end, Janie confronted Griles, telling him that he lied about the nature of the session. His response, she said, was to grin a teenage boy grin and say "that's politics." After Reagan was elected, Griles became the Director of the Office of Surface Mining where Janie's job was to assess civil penalty fines against coal mining operators whose operations had been found to be in violation of SMCRA. Griles tried to abolish the assessment office, which, but for the environmentalists who had fought long and hard for SMCRA, he would have accomplished. Seeing the handwriting on the wall--that she was persona non grata--Janie got assigned to another job. At the end of that assignment, Griles made it clear he would make it as difficult as possible for her to get another government assignment--reportedly saying at a high level meeting of political appointees. "Why would we want to help her, a Democrat, environmentalist, feminist?" Well, the story continues with Griles attempts to get her fired countered by Janie's maneuvers to stay employed (which she did). After the Reagan administration, Griles was fired. The first President Bush refused to keep him, having gleaned how dishonest he was. Even Peabody Coal wouldn't hire him. By the time Griles regained a foothold in the Interior Department as the Deputy Secretary under Gale Norton, Janie had retired so she warned her friends about him. One by one they came to see how slimy he in fact was. And now, thanks to what remains of our criminal justice system, Griles is going to jail. Janie has a big smile on her face--Democrat, feminist, environmentalist vindicated! Now, six years later, the Bush plan for ruling the country and the world is unraveling. During those six years, an extraordinary amount of damage has occurred. 1. 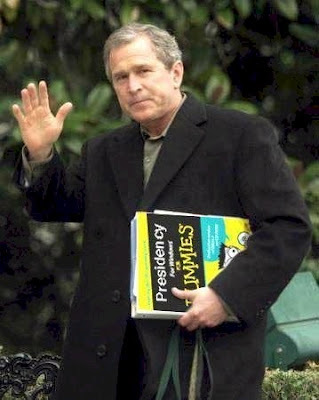 Bush doesn’t read. At least he doesn’t read history. The book he’s carrying under his arm in the photo left out a chapter on history, which is replete with stories of imperial overreach, wars launched for the wrong reasons in the wrong places at the wrong time, and unlimited greed invariably resulting in failure to "get it all." 2. Bush's Hubris, which is described in part in Hubris: The Inside Story of the Spin, Scandal, and the Selling of the Iraq War, by Michael Isikoff and David Corn. 1. Resisting Congress’ request for testimony and documents related to why the eight U.S. attorneys were fired is part of Bush’s expansion of presidential power. See the March 22 New York Times article, Bush's Big Picture Battle: Presidential Prerogatives. 2. What about the November 16 to December 7 “Document Gap” as reported this morning in the New York Times here? I’m want to know if there are documents and e-mails from or to the White House and the Department of Justice, and if there are, what do they say? 3. I want to add my support as a blogger to the efforts of Joshua Micah Marshall, of TalkingPointsMemo.com, who is being given credit for singlehandedly keeping the purged prosecutor story alive until the mainstream media caught on. 4. Bush’s claim of “executive privilege” needs to be challenged if he refuses to honor the subpoenas requiring Rove and Miers and other White House officials to testify under oath. This looks like the perfect issue to take him on because we have a United States Supreme Court case, U.S. vs. Nixon in support of our challenge. A Daily Kos blogger, Scientician, posted an excellent article on March 21, Executive Privilege is Not an Absolute, leading with this statement, “The idea that the President can arbitrarily declare evidence off-limits belongs on the ash heap of history along with the "Divine Right of Kings," "Unitary Executive" and the 'Doctrine of Papal Infallibility;' absolute rubbish invented by the mendacious to rationalize that most human of impulses." 5. As a lawyer, I’m been wildly curious about what options are available if Bush refuses to honor the subpoenas that the House Judiciary Committee has been authorized to issue. I’m researching this issue and am asking others what they think; your opinion is welcome. 6. I support impeachment of the Bush, et al. If Bush refuses to honor the subpoenas, I’m not counting on the United States Supreme Court to bail us out as it did when Nixon was facing impeachment (see my March 17 post, “Ignored Subpoenas = Impeachment?). We need to hold the Republican’s feet to the fire. Bush replaced all 93 U.S. attorneys when he became President. See Glenn Greenwald's March 19 post, “Republicans and U.S. attorneys – then and now.” It’s standard behavior to start with a fresh team of U.S. attorneys when the president’s belongs to a different political party than his predecessor. Firing eight prosecutors in the middle of the President’s term is unprecedented. How would we know this stuff if we didn’t stay on this story? According to today’s Kansas City Sun, North Korea nuclear talks break down. The problem appears to be that no one wants North Korea’s money, and a provision in the 2001 Patriot Act has created this problem. According to the article, “Three days after the Bush administration announced a breakthrough plan for freeing $25 million in North Korean funds, talks over the country's nuclear program collapsed Thursday when several banks balked at accepting the frozen assets.... Without the cash in hand, North Korean envoy Kim Kye-gwan (photo) bolted multilateral nuclear talks and returned to Pyongyang, expressing anger at the delay." It appears that, “A little-noticed provision of the 2001 Patriot Act has given foreign banks reason to be wary of U.S. regulators.” Banks in South Korea, China and Russia have refused to accept the money and disburse it on behalf of North Korea because they fear entanglement with these regulators. The solution, according to Russian Deputy Foreign Minister Alexander Losyukov, is, "The U.S. administration should submit . . . written warrants that transactions with North Korean assets will not have consequences for anyone." Bush vs. Congress - "A Full-blown Constitutional Crisis?" On March 21, a House Judiciary subcommittee authorized subpoenas for Karl Rove, President Bush’s political adviser, and other senior White House officials in the investigation into the firing of eight United States attorneys, as reported by the New York Times. According to the article, Bush responded defiantly, saying he would resist any effort to put his top aides under “the klieg lights” in “show trials” on Capitol Hill, and Tony Snow said that the White House offer to allow no-transcript private interviews with Karl Rove and Harriet Miers would be withdrawn if subpoenas were issued. The New York Times March 21 editorial, What People Really Need, described Bush’s offer of interviews as a formula for hiding the truth, leaving the people in the dark. My concern is that political path will result in “interviews” with no transcripts. I can’t imagine why the Democrats would concede when they have a winning case regarding the inapplicability of “executive privilege” to interviewing Rove and other White House officials about the firing of 8 U.S. attorneys. As so ably described in Glenn Greenwald’s post on March 20, The president's oh-so-noble-reliance on "executive privilege, Bush intends to invoke the same doctrine used by Presidents Nixon and Clinton in their respective (unsuccessful) attempts to resist subpoenas. Perhaps the focus on the purging of prosecutors in order to expose how the Bush administration conducts business is because this issue does not involve “military, diplomatic, or sensitive national security secrets.” It should be easier to overcome executive privilege as a defense to learning more about the firing of U.S. prosecutors than it would be regarding the equally important issues of the torture of detainees and warrantless domestic eavesdropping. I’m hoping Congress doesn’t cave like the 9/11 Commission did by interviewing Bush and Cheney (no testimony under oath, no note taking) in the Oval Office regarding what was known about Al-Qaeda before 9/11, the subject of my post on February 10, 2007. I'll take a full-blown constitutional crisis any day. On January 26, I posted “Keeping Our Eye on Petraeus.” General David Petraeus had just been appointed as U.S. Commander of our military forces in Iraq and was on his way there. Now that he’s been there for almost two months, what’s being said about him? In my January 26 post, I referenced the Harper’s Magazine article about the new counterinsurgency field manual, FM3-24 DRAFT, mainly authored by Gen. Petraeus. On March 17, AlterNet published According to U.S. Military Theory, We Can't Win in Iraq, going into some detail about the counterinsurgency manual. It’s worth reading and concludes with this statement: "Petraeus the general still insists that the war can be won; Petraeus the theorist would seem to disagree." I’ll continue my “Petraeus Watch” and keep you posted. Today, exactly four years after Bush launched his war of choice against Iraq, it feels appropriate to look back at what was being said a few days before, during, and after the March 19 air attack on Baghdad. Selecting quotes from March 5 -7, 10, 14, 16-21, he adds in brackets “where are they now” updates. Here’s what Rich wrote on March 7: "Appearing before the United Nations Security Council on the same day that the United States and three allies (Britain, Spain and Bulgaria) put forth their resolution demanding that Iraq disarm by March 17, the director general of the International Atomic Energy Agency, Mohamed ElBaradei, reports there is 'no evidence or plausible indication of the revival of a nuclear weapons program in Iraq.' He adds that documents 'which formed the basis for the report of recent uranium transaction between Iraq and Niger are in fact not authentic.' None of the three broadcast networks’ evening newscasts mention his findings. [In 2005 ElBaradei was awarded the Nobel Peace Prize.]" Has anyone in power learned the lesson of President Nixon’s refusal to honor the subpoenas issued by the House Judiciary Committee in 1974? If the White House, aka President Bush, remembers what happened to President Nixon when subpoenas were issued and he refused to honor them, he might well decide to produce the requested information. If Rep. John Conyers, (photo) as Chair of the House Judiciary Committee, remembers that the Committee added Nixon's refusal to honor the subpoenas to the articles of impeachment, he will immediately initiate impeachment proceedings if Bush refuses to honor the subpoenas. According to The Case for Impeachment by David Lindorff and Barbara Olshansky, at page 53, Nixon’s refusal to honor a subpoena for the infamous secret tapes (of all conversations in presidential offices) was added as a count to the articles* of impeachment. The United States Supreme Court intervened, ordered access to the tapes, and within four days of publication of the contents of the tapes, Nixon resigned. In a New York Times article on March 17, White House Delays Action on Attorneys, “The White House has delayed until next week a decision on whether to release additional documents and to permit top aides to President Bush, including Karl Rove, the chief political adviser, to testify in a Congressional inquiry into the dismissal of federal prosecutors…. Rep. John Conyers, and Senator Charles Schumer, the New York Democrat who is spearheading the inquiry in the Senate, seemed inclined to give the administration a few more days. Separately, the committees expect to receive additional documents from the Justice Department on Monday." 4. Will the public insist that "Enough is enough," as it did with Nixon, and demand that impeachment proceedings being? 5. Will the House Judiciary Committee listen to the public? *The articles of impeachment included Nixon's abuse of power in ordering the IRS to audit the tax returns of his enemies and the false statements he made to Congress about the bombing of Cambodia during the Vietnam War. On March 14, the following headline in the Washington Post, White House Cites Lax Voter-Fraud Investigations in U.S. Attorneys' Firings, struck me as a totally implausible reason for purging the prosecutors: “The GOP allegation, repeated in several swing states where voting margins have been narrow, is that Democrats have illegally ratcheted up their tallies by permitting ballots to be cast by felons, by residents without proper identification, or by people who forged signatures on absentee ballots." Because I’ve been involved in election integrity issues since 2003, I receive daily alerts related to this issue. On March 6, I received an alert that Claims of “Voter Fraud” Often Manufactured, Exaggerated for Political Purposes, Says New Report from Project Vote from ProtectVote.org. The alert summarizes the report as follows: “Widespread 'voter fraud' is a myth promulgated to suppress voter participation, according to a new Project Vote report released this week: 'The Politics of Voter Fraud' finds that fraudulent voting, or the intentional corruption of the voting process by voters, is extremely rare. Yet, false or exaggerated claims of fraudulent voting are commonly made in close electoral contests, and later cited by proponents of laws that restrict voting." One place I go for information is Election Data Services. It was hired in 1980 by the Federal Elections Commission to conduct studies of what voting equipment has been used in the U.S. They have conducted studies ever since, with the most recent study available here. As reported, in 2006, of the 170 million registered voters, 69 million had their votes counted on optical scan voting machines and 66 million used electronic equipment. What the report doesn’t tell us you is that 79% of the votes in this country are counted on secret software. That’s the real problem with the elections, not voter fraud. 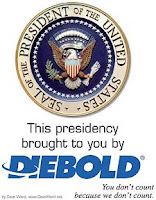 Both optical scanners and “electronic equipment,” aka “touchscreen voting machines,” are in the hands of private vendors, primarily Diebold and ES&S. Secret software counts 135 million votes, which is 79% of the total of 170 million. Of course, not all 170 million registered voters vote, but the votes cast are counted by optical scans, touchscreens, etc., in roughly the same proportions. A couple of days ago, I received an e-mail from Paul Lehto, an attorney in Everett, Washington. We are both working with ElectionDefenseAlliance.org, and his message is directed to EDA: "The chance here is to highlight how these nonexistent voter fraud issues emanate from the VISIBLE portion of our elections systems. But there is also a huge INVISIBLE portion of our elections systems that is unmonitored, and is where any reasonable criminal would operate. This is the realm of trade secret electronic vote counting by private vendors, where democracy itself has been outsourced, privatized and transparency eliminated." Recently, even the mainstream media has been covering stories about the problems with electronic voting machines. Recently, the mainstream media has been reporting on the problems with privatizing vital services, like care of wounded soldiers at Walter Reed Hospital. Privatizing public services, including vote counting, is the problem. "Voter fraud" is not the problem. Will this be the nail in Gonzales’s coffin? Murray Waas, the intrepid investigative journalist for the National Journal, posted an online article this morning, Aborted DOJ Probe Probably Would Have Targeted Gonzales. According to Waas, “Shortly before Attorney General Alberto Gonzales advised President Bush last year on whether to shut down a Justice Department inquiry regarding the administration's warrantless domestic eavesdropping program, Gonzales learned that his own conduct would likely be a focus of the investigation, according to government records and interviews. Bush personally intervened to sideline the Justice Department probe in April 2006 by taking the unusual step of denying investigators the security clearances necessary for their work." Did Gonzales tell Bush that his own conduct was about to be scrutinized? Waas quotes Charles Wolfram, a professor emeritus of legal ethics at Cornell University Law School, who said that if Gonzales did not inform the president, Gonzales ill-served Bush and abused "the discretion of his office" for his own benefit. However, if Gonzales did inform Bush that the probe might harm Gonzales, then "both [men] are abusing the discretion of their offices." The investigation of the Department of Justice on the warrantless domestic eavesdropping was instigated by the Office of Professional Responsibility, an investigative arm of the DoJ. Current and former Justice Department officials called Bush’s actions unprecedented in the office’s history. Update to "A Known Known"
I won't be surprised if I learn tomorrow morning that Gonzales has resigned for "personal reasons." What is going to happen to Attorney General Alberto Gonzales as a result of the purging prosecutors scandal? Based on the most recent news, I immediately thought of Donald Rumsfeld’s legendary bizarre response to a question at a February, 2002 press conference, “There are known knowns; there are things we know we know. We also know there are known unknowns." However, we have a “known known” from Gonzales’ past that tells us exactly who this person was and is, the July 2003 Atlantic Monthly’s The Texas Clemency Memos. I read this article when it came out and have not forgotten it. Excerpts from the article: During Bush's six years as governor 150 men and two women were executed in Texas—a record unmatched by any other governor in modern American history. Each time a person was sentenced to death, Bush received from his legal counsel a document summarizing the facts of the case, usually on the morning of the day scheduled for the execution….The first fifty-seven of these summaries were prepared by Gonzales…. Bush allowed the execution to proceed in all cases but one. On May 6, 1997, Terry Washington, a mentally retarded thirty-three-year-old man with the communication skills of a seven-year-old was executed. In at least two other capital cases profound doubts about guilt were raised by the defense but virtually ignored by Gonzales. Whether Alberto Gonzales remains as U.S. attorney general, resigns, or is impeached, The Texas Clemency Memos are worth reading for what they tell us not only about Gonzales but also about President Bush when he had the power to condemn people to death. Are we are where we are today, with prosecutors being wrongfully purged, the FBI misusing National Security Letters, torture of prisoners, warrantless wiretaps, etc., because The Texas Clemency Memos have been ignored or forgotten? A couple of years ago, I learned about the Nuclear Threat Initiative, and signed up for its news updates at Global Security Newswire. Typically, these e-mail alerts alerts end up in an inbox for later reading. Why hadn’t I seen this alarming news anywhere else? With trepidation I read the article, which opens with, “The United States has made little progress in developing a conventional ‘prompt global strike’ capability, leaving the military few options short of a nuclear attack in certain scenarios,” the Commander of the U.S. Strategic Command, James Cartwright, said yesterday. James Cartwright is responsible for the global command and control of U.S. strategic forces, including full spectrum global strikes, space operations, computer network operations, information operations, strategic warning, integrated missile defense, global Department of Defense Architecture Framework, and specialized expertise to the joint warfighter. On March 8, Cartwright testified before the House Armed Services Strategic Forces Committee that a major threat must be addressed at intercontinental ranges immediately, and there is no option except for a nuclear-armed ballistic missile. Having read several of Cartwright’s speeches (a recent one is available here) in conjunction with the March 9 Global Security Newswire article, it was clear that the startling pronouncement regarding a nuclear attack as the only option is intended to put pressure on members of Congress to approve placement of conventional warheads on Trident missiles now armed with nuclear weapons. Whether the announcement that a nuclear attack is the only option currently available was intended to prepare us for the eventuality of using nuclear weapons or to pressure Congress into a plan that would replace nuclear weapons with conventional weapons on missiles, I expect the media to cover this story. 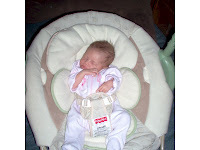 If Kevin Drum of Political Animal posts photos of his cats most Fridays, I thought it would be okay to occasionally post photos of my youngest grandchildren. I just spent the last 20 hours with them. Being with infants is a wonderful change in focus from the woes of the world. Whether or not I am allowed* to join the International Polar Year (IPY) scientists on a trip to the North or South Pole, I am finding this project very exciting and incredibly important. It is so big and so complex that it will be difficult for me to convey to you what this project is about in a few short paragraphs. Please bear with me as I try to impart my enthusiasm for IPY in a few more paragraphs than usual. Because my excitement is a result of listening to the interview of two IPY scientists on National Public Radio on March 2, I’m going to primarily focus on what they said. 2. Dr. Jody Deming, (photo on right) a member of the U.S. National Committee for the IPY and professor of biology, oceanography and astrobiology at the University of Washington. 2. To bring out fundamental discoveries in many research areas, including genomics in biology, polar biology, adaptation to change;and to look at the affects of pollution, climate change impact on disease, and circumpolar infectious disease surveillance. 3. To spark growth and education, and inspire the next generation of scientists, engineers and physicians. Dr. Deming focused on the ice: ” The ice determines so much about what happens in the Arctic Ocean…. ice determines not only weather patterns and how the ocean flows, but how life exists in that ocean, how ecosystems are structured….it’s an opportunity to study the limits of life on our planet….as climate changes - and so rapidly in the Arctic – [it’s an opportunity to study] the types of genetic systems that we may lose the chance to learn about as we lose the ice where they live. The host of the show, Ira Flatow, asked Dr. Deming, “What genes are in the ice? Ira also talked with Will Steger, a polar explorer for thirty years, who called in from Baffin Island on his 1,200 mile trip through arctic Canada. The purpose of his trip is to increase awareness of climate change. Steger said that he had previously crossed the Larsen A and B ice shelves, and “These are totally disintegrated now.” Steger had four Inuit hunters with him, who observed changes that they had never seen before, such as a running stream that previously had always been frozen. For anyone as interested in this as I am, the whole interview can be heard here and the transcript ordered here. link, Chart v. 4.4 presents in honeycomb fashion all of the projects related to IPY. An associated spreadsheet provides the full project names and lead persons for each proposal. *See my March 10 post. This morning I intended to post more about the International Polar Year because numerous people who read about it in my post yesterday are very interested in it. However, it’s an incredibly beautiful day, and my apple tree needs to be pruned before it bursts into blossom. Therefore, I decided to make this “Blogger Appreciation Day” and feature the three bloggers that I turn to daily to find out what’s going on. Daily blogging is a lot of work! On March 2, while listening to Science Friday on National Public Radio, I heard about the International Polar Year for the first time. How could I have missed this? Easy answer: the last comprehensive study of the poles, then called the International Geophysical Year occurred in 1957-1958, when I was seventeen and not paying much attention to what was going on in the world. The International Geophysical Year was modeled on two previous International Polar Years, 1882-1883 and 1932-33. The stakes are much higher now, because of global warming, which is happening faster at the poles than anywhere on the planet. 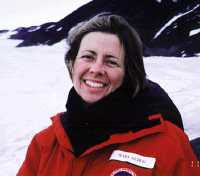 Dr. Jody Deming, a member of the U.S. National Committee for the IPY and professor of biology, oceanography and astrobiology at the University of Washington. Two women! When I heard Dr. Albert say in reference to the IPY, “So we would love to have a giant campaign of reaching out to students of all ages…people in the community and senior citizens,” I visualized myself on an ice cutter like the one in the accompanying photo, heading for one of the poles. I immediately e-mailed the U.S. National Committee for the IPY and volunteered to go to either pole and help. I described my willingness to mediate any disputes among the participants. After all, I’ve been a mediator since 1982. I can’t imagine that a bunch of scientists working closely in an extreme environment wouldn’t need a mediator sooner or later. I also volunteered to gather/organize ice samples, cook, clean, and give back rubs. A week has gone by, and I haven’t heard from anyone yet that they would love to have me along. But I’m not giving up! here. The official IPY site is here. I plan to post updates on the IPY, unless of course, I’m on an ice cutter on my way to a pole! Will Bush Succeed at Wooing Latin Americans with His Sweet Talk? But how do the majority of Latin Americans feel about the United States? Isn’t it possible that they don’t like Bush but like us? Sorry, folks, according to a poll released yesterday by World Public Opinion, we’re not all that well liked. A summary of the report is available here. Here’s a quick rundown of the four countries where the survey was conducted. Of these, Bush is visiting Brazil and Mexico. Mexico: 53 percent look unfavorably on U.S. influence and only 12 percent favorably. Chile: Respondents say U.S. influence is negative by a margin of 51 percent to 32 percent. Argentina: A 64 percent hold a negative view to 13 percent who view us favorably. The summary also reports that other polls in the three countries Bush is visiting, Uruguay, Guatemala, and Columbia, also show dissatisfaction with either the United States or President Bush. Since Venezuela’s president, Hugo Chavez, is going to lead an anti-Bush rally today in Argentina, we can all be glad that Bush is not going there. The Tom Toles cartoon, above, says it all. 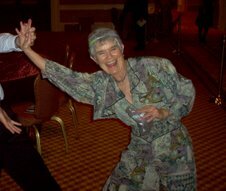 My friend, Pat Denino,* who has blogged since October, 2005 at Wondering Wanderings, sends me a “photo of the day,” most often taken by her. Yesterday morning, this photo arrived. 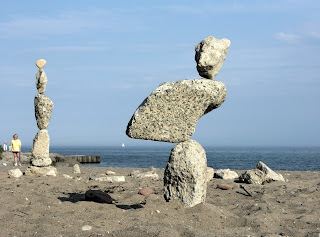 The description “balancing act” came to mind immediately, and of course I moved from considering the precarious arrangement of the balanced rocks to the balancing act in my life, which often feels precarious. For me, all I need to know is that achieving a balanced life is not a natural act for me; it’s something I need to pay close attention to. The trouble is that for the past few years, I have become pretty comfortable being unbalanced by my citizen activism. However, I have discovered that happiness is a by-product of living right, so sooner or later I move toward balance. *Pat and her husband George offered to share their home with out-of-state recount observers and attorneys who went to Columbus to assist in challenging the 2004 Presidential election. I stayed with them in January of 2005, along with two other Californians, when we went to Ohio to work with the some of the citizens there who were reorganizing to continue the battle for election integrity in that beleaguered state. Pat and I have become fast friends. Pat, more than anyone else, encouraged me to start blogging. On January 10 of this year, Dr. Peter Phillips, a professor at Sonoma State University and director of Project Censored, came to Healdsburg to speak at an impeachment forum I organized (with a lot of help) and moderated. At the end of the forum, Dr. Phillips announced We're Not Buyin’ It, a shopping boycott from April 15, Tax Day, until April 22, Earth Day. Its goals include showing opposition to the war in Iraq and support of impeaching Bush and Cheney. If our continued participation in the American economy helped put us where we are today, bogged down in two wars and living with the possibility of yet another attack on another country, why not consider doing the opposite? That’s the goal of the We're Not Buyin’ It campaign. The appeal to me is that I can do nothing and still make a difference. I can just stay home and not shop from April 15th to the 22nd. I need this because I’m worn out from several years of citizen activism. But for those who want to do more, go to We're Not Buyin’ It. You will find many things you can do in addition to not shopping for a week. Here you will find the businesses that deserve our support. For years I’ve compared writing to making bouillabaisse soup. 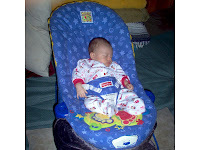 Both tasks are carried out with great care and attention to detail. Here’s my vision of how the soup is made, and you will be able to ascertain how it applies to writing. First, you take a big fishnet and, standing on a rock jutting out into the sea, cast it as wide as you can. After you gather the net and pull it up on the rock, you begin a careful examination of everything caught in it. Ah, here’s a starfish leg, which you toss back into the sea. And here’s a wonderful little fish, not too bony. You continue this process, throwing out the bits of seaweed, empty crab exoskeletons, tough old fish with bulging eyes, etc., keeping the right-sized fish, chunky crabs, and mussels pulled off the rock. Gathering up your net and a bucket of edible morsels, you trudge home, put on an apron, and start the process of making the soup. Each item worth saving is carefully prepared and put in the pot along with the perfect soup base. You now add the special items that make bouillabaisse soup unique: saffron, fennel and orange zest. Since it’s believed that “bouillabaisse” is derived from the French “bouillon abaissé, " meaning to “reduce by evaporation” you let it simmer over a very low fire for a long time. Before it’s served, Editor (conveniently named) sails into the kitchen with a keen eye and a ladle. After she pulls out a stray fish bone and a tiny clump of seaweed, she advises you to add a pinch more saffron. Grateful for Editor’s extraordinary attention to detail, you follow her advice. Now, finally, the bouillabaisse soup is ready to serve. I’ve decided to write a book review, with the blessings of the editor, Mark LaFlaur,* of Joe Conason’s IT CAN HAPPEN HERE - Authoritarian Peril in the Age of Bush. This is the first book review I’ve ever written, but if it’s good enough, it will be posted at OpEdNews.com and perhaps elsewhere. Want to help me? Read the book and send me your comments by April 15th. I like the idea of asking for your input because it appears that Joe got a lot of help from others. In the book’s Acknowledgments, Joe listed many people who “graciously assisted with advice, research, clippings and miscellaneous requests.” He then added, “This book was informed by the work of many writers,” and listed 92 of them! Like Joe, I plan to do the challenging work of writing something worth reading, but I’m convinced the book review will be much, much better with your help. *Mark LaFlaur contacted me by e-mail in 2004 as I scoured the country looking for help with challenging the results of the 2004 Presidential election in Ohio. I had no idea who he was or how he found me, but we’ve stayed in touch. Mark became very involved in the aftermath of Hurricane Katrina. With his wife, Janet, he organized LeveesNotWar.org. In July of 2006, I learned that Mark is the Senior Editor at Thomas Dunne Books because he sent me The Case for Impeachment, by David Lindorff and Barbara Olshansky, as a thank you gift for my citizen activism. I feel very fortunate to know this man. How can a retired unelected official have this much power? I think we all noticed the stock market slide last week. We’re told that it had to do with what happened in China. However, a March 2 article in the New York Times, Greenspan Is Still Able to Move Markets, caught my attention. Whoa, I thought to myself: how is this retired, unelected official, the former chairman of the Federal Reserve, able to have such an impact? I have no idea why Greenspan gave his opinion about a recession or why the stock market took a nose dive as a result; I’m sure we’ll learn more eventually. However, reading this article jogged my memory about what I know about Alan Greenspan, who, as the chairman of the Federal Reserve, was commonly described as the most powerful man in the U.S.
1. That one person, unelected, whether in office or retired, can have such a huge impact on our and the world's economy. I am so offended by this! Mothers and fathers of the world’s 38,000 children who are dying daily from starvation and diseases would love a 50% increase in income, even if it only added a year to the life of their child. Perhaps during that year, http://www.heifer.org/ would come to the village and offer help in the form of a coat or cow that would help sustain that family. Furthermore, if the $1 trillion were devoted to cleaning up the drinking water in developing countries and other life-sustaining projects, the lives of 3 billion people could indeed be improved. Why is the press ignoring the arrest of Dr. Sarah Wykes in Angola? A couple of weeks ago, NPR reported that Sarah Wykes of Global Witness had been arrested in Angola. She was charged with spying and violating the country’s national security. I’ve been trying to out what is happening to Wykes, but where’s the news? The Global Witness website reported on February 28 that she was released from jail but is not allowed to leave the country and still faces trial, which may not start for a year. According to a February 20 report on Wykes’ arrest by the UN Integrated Regional Information Networks, Dr. Wykes, an experienced researcher into the links between corruption and human rights in resource-rich economies, arrived in Angola on February 11 to meet with local representatives involved in the international campaign for transparency. She was arrested on February 18 and charged with carrying subversive materials. Yesterday Arthur M. Schlesinger, Jr. died at age 89. I note his death because Schlesinger had a profound impact on my life in my 20’s. Raised by parents who believed that there was a Communist under every domino and that all the dominoes in the world were lined up ready to bury the United States, I had conflicted feelings about the Vietnam War. Searching for answers, in 1967 I read Schlesinger’s The Bitter Heritage – Vietnam and American Democracy and was convinced that the Vietnam War was a huge mistake. We needed to get out of there.